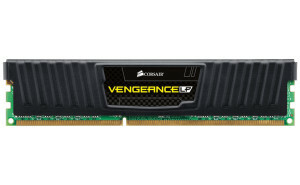 Today, Corsair announces the availability of Corsair Vengeance Low Profile but still High-Performance DDR3 Memory Kits in addition to their award-winning Vengeance Series. These new memory kits have shorter heat spreaders, as seen in the picture below, for tight or space-constrained applications. Also the kits heat spreaders are available in various colors like White, Blue and Black. Vengeance LP are designed to operate in low voltage of 1.5V and is ideal for 2nd generation Intel Core systems. However the Special Edition Vengeance Arctic White operates at a very low voltage of 1.35V only. Below is a list of the available Corsair Vengeance Low Profile memory modules in different configuration. Like any other memory kits, Vengeance LP are compatible with Intel and AMD systems. The Corsair Vengeance is ideal for PC enthusiast and gamers that wants to build a high performance and overclock-able system for a great and cheaper price compared to its predecessor, the high performance Venageance, and Dominator series.